Looking for garden care advice on how to fix your patchy and thinning lawn? Luckily for you, we have all of the lawn care and Turf Tips you need to have your garden looking lush and green all year around. Symptoms of a patchy and thinning lawn are easy to remedy. In our latest blog, we show you just how easy it is! Often found at the edge of paving, decks or in front of the letterbox or clothes-lines, bare patches of lawn are a sorry sight. Bare patches are typically a result of excessing wearing from high foot traffic areas and general backyard use. Repairing the area with a patching product or lawn seed is often an easy fix. Long term, you may want to consider adding stepping stones to your garden or a small pathway through the lawn if the area is used regularly. Have you recently brought home your new furry friend, but noticed a significant change in your garden? 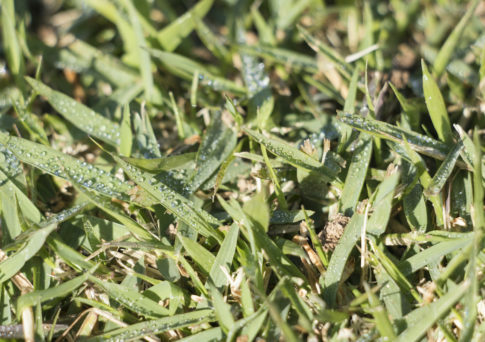 It may sound strange, but dog urine can drastically change your grass (patch-by-patch). Female dog urine can have a burning effect on the grass; whereas, male dog urine can act as a concentrated fertiliser, promoting excessive growth. To counteract this, try watering the area heavily as soon as you notice the damage, or you can look into PH balancing lawn care products to help too. If you have tried everything else to bring your grass back to its once lush appearance, and are still have dry grass, then the damage is likely a combination of seasonal extremes and neglect. Adopting a regular lawn care routine should help remedy your thinning turf, but this must be maintained long-term for lasting results. Aeration is one of the basic needs of a lovely lush lawn too, along with a good fertiliser and regular mowing. It’s often quite easy to see when your lawn needs to be aerated, because the soil becomes compacted along high traffic areas. This is particularly common if you park your car on the lawn and the grass starts to thin; leaving you with bare patches along the line of traffic. You can read one of our latest blogs on how to aerate your lawn back to life, here. Go Turf is the largest independent turf producer on the Sunshine Coast. We pride ourselves on supplying developers, builders, landscapers, home-owners and other turf producers with high quality and amazing value grass suited for South East Queensland conditions. Don’t hesitate to contact our team with any of your lawn care questions.